A* search is an informed search algorithm used for path-finding and graph traversal. It combines the advantages of both Dijkstra’s algorithm (in that it can find a shortest path) and Greedy Best-First-Search (in that it can use a heuristic to guide search). It combines the information that Dijkstra’s algorithm uses (favoring vertices that are close to the starting point) and information that Best-First-Search uses (favoring vertices that are closer to the goal). Let g(n) represent the exact cost of the path from the starting point to any vertex n, and h(n) represent the heuristic estimated cost from vertex n to the goal. Dijkstra’s algorithms builds a priority queue of nodes ordered on their g(n) values. 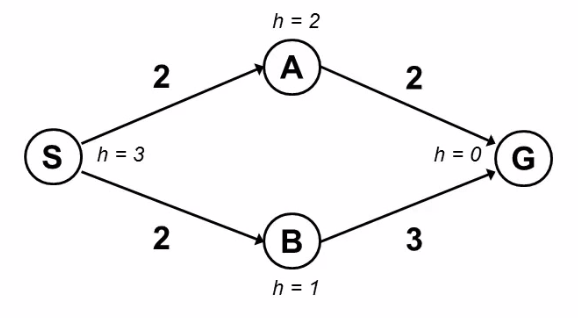 Best-First-Search employs a priority queue of nodes ordered on h(n) values. A* balances the two as it moves from the starting point to the goal. It builds a priority queue of nodes ordered on f(n) = g(n) + h(n) which is the total estimated path cost through the node n.
We can eliminate the repeated work by maintaining a closed set of expanded nodes and adding only those nodes to the priority queue which are not in the closed set, thus yielding a graph search algorithm. The optimality of A*-GRAPH-SEARCH places stronger demands on the heuristic, requiring it to be consistent. A heuristic is consistent if it approximates the actual path cost in an incremental way without taking any step back. Formally, for every node N and for every successor P of N, h(N) <= h(P) + cost(N, P). Fortunately, most natural heuristic functions (particularly those obtained by relaxing problem constraints) are consistent. Lets work through this example. First, S is expanded and nodes A (f(A)=4) and B (f(B)=3) are pushed onto the queue. Then, B (having smaller f value) is expanded and G (f(G)=5) is pushed onto the queue. If we declare victory as soon as we push it onto the queue, we will choose the path S->B->G (having cost 5) and not the shorter path S->A->G (having cost 4). For an application of A* search, see N-puzzle problem and its solution in python using A*-GRAPH-SEARCH and Manhattan distance as heuristic. This entry was posted in Algorithms, Artificial Intelligence, Hackerrank and tagged 15 puzzle, 8 puzzle, A* search, admissible, consistent, Dijkstra's single source shortest path, Graph Search, Greedy Best-First-Search, Heuristic function, manhattan distance, N-puzzle problem, optimality, priority queue, python implementation, tree search. Bookmark the permalink.